Fall in love with the multiple colors of gold in these 14K tri-color gold love knot post earrings from Apples of Gold Jewelry! Whether you aren't sure which color gold is your favorite, or you love the look of the three colors together, these earrings offer a fun twist on the love knot design! Made from 14K white gold, yellow gold, and rose gold, each color makes an appearance in the love knot design. The post of the earrings is made from yellow gold. The earrings each measure 7.5mm in size, and are perfect for special occasions or daily wear when you want something a little bit different! 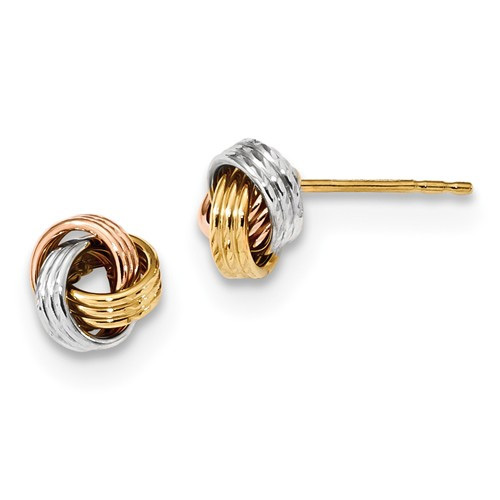 We guarantee our 14K Tri-Color Gold Love Knot Post Earrings to be high quality, authentic jewelry, as described above.